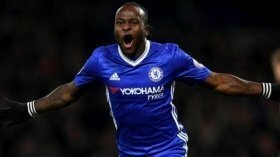 Palace set to sign Moses? The 28-year-old, who initially started his career with Palace, has struggled for regular gametime with the Blues this term and has managed just five appearances in all competitions. According to Evening Standard, the reduced gametime has resulted in the attacker consider a fresh challenge away from the Bridge and Palace seem the front-runners to re-sign him, eight years after he left the club. Aside from Palace, Wolverhampton Wanderers and ex-loan club West Ham United have also expressed an interest but Moses is said to favour a return to the Eagles where he started his professional career. Palace have been fighting a relegation battle since the start of the season but they have recently got themselves some leeway after a shock 3-2 defeat on the road to Manchester City. Roy Hodgson's side are currently four points adrift of 18th-placed Cardiff City, whom they are scheduled to face in the next league meeting on Boxing Day.